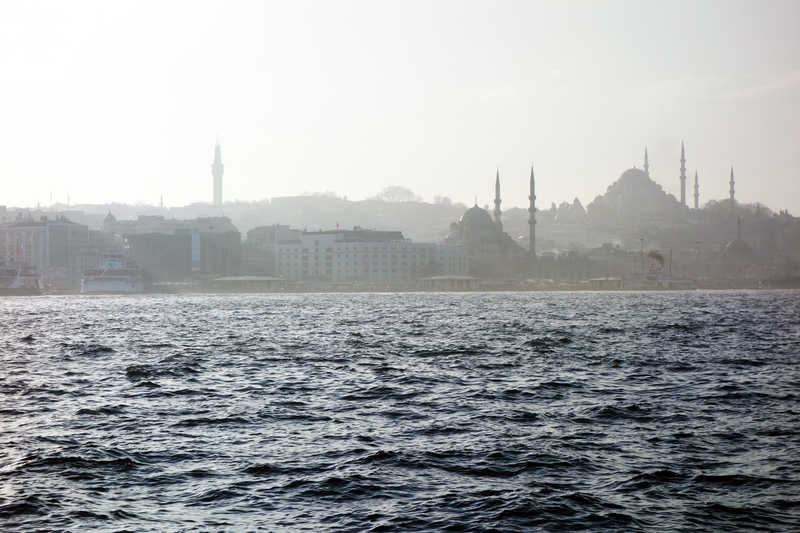 On my last day in Istanbul I crossed the Bosphorus and I did so to get a good lahmacun. Why did I sail to Asia three hours before my flight instead of going somewhere local near the hotel? Because I subconsciously hoped to miss the plane and to stay in Turkey a while longer. Because the crisp, blue waters beckoned strong on a sunny day. But I also did it because apparently the European continent just doesn’t do this Turkish staple any justice. Each local I had met had given me a unique recommendation of where to find the best version. 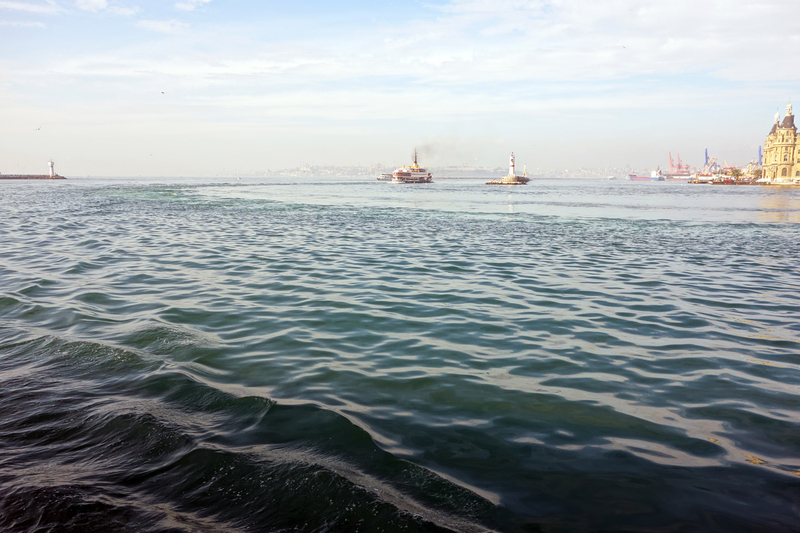 The places suggested all had in common an address in Kadıköy, a bustling neighborhood by the scenic Asian ferry port. So I went there and stumbled serendipitously into Halil Lahmacun, which a friend and a ferry captain had both named their favorite. The pint-sized restaurant is tucked away in a quiet market alley near the stall of a fish and seafood vendor. The kitchen is a brick oven and a prep station around it, both in the middle of the first floor dining room. It’s run by a guy named Fuat Dörtok, son of Halil Dörtok who opened the place back in 1980. Fuat’s the master and he mans the oven. He inserts a slender wooden board topped with thin rounds of dough and drops them to sizzle against the screaming hot oven floor. Expert intuition tells him when they’re ready; he pulls them out and lands them on a plate with a single deft movement. 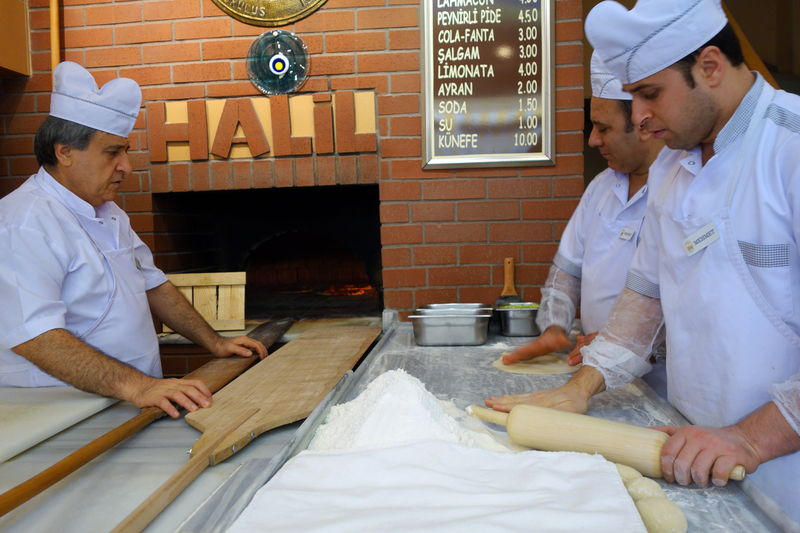 In the meantime he observes his doughboys patiently, earnest lahmacun apprentices in training. They stand facing their captain at a short assembly line between a mise en place of dusting flour and another of topping ingredients. One guy stretches and rolls the dough thin. The other pats on the meat and does crazy spinning tricks to stretch the dough thinner still. 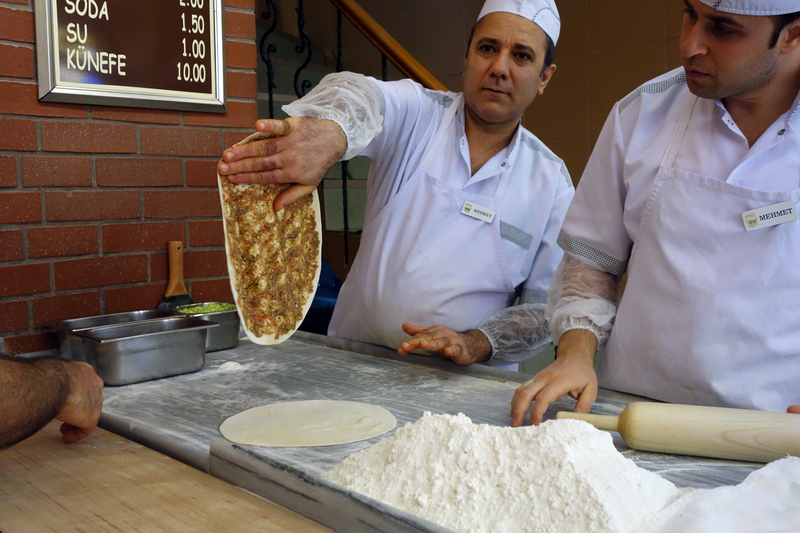 Halil Lahmacun focuses on just one thing and it’s minced lamb lahmacun, which they make spicy or not spicy upon request. 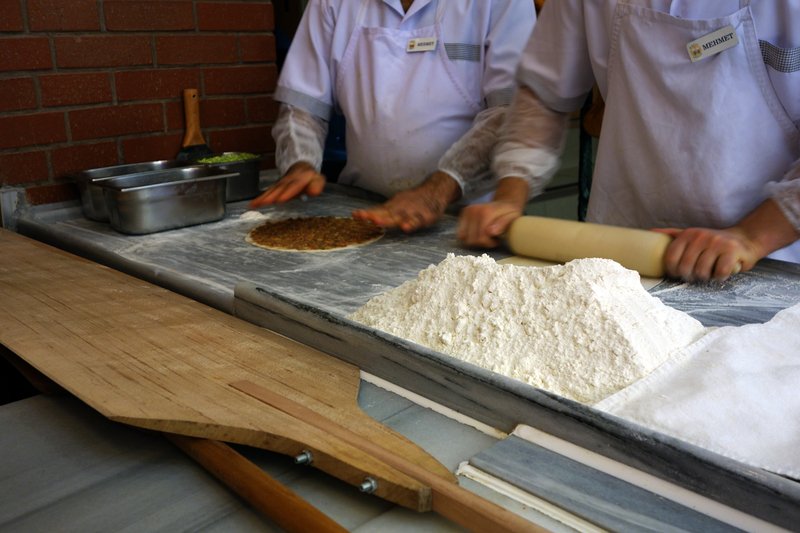 They bake one other thing, a bready pide from the same dough, but nothing additional goes into its prep. Lahmacun is not pizza. There’s not a variety of toppings. 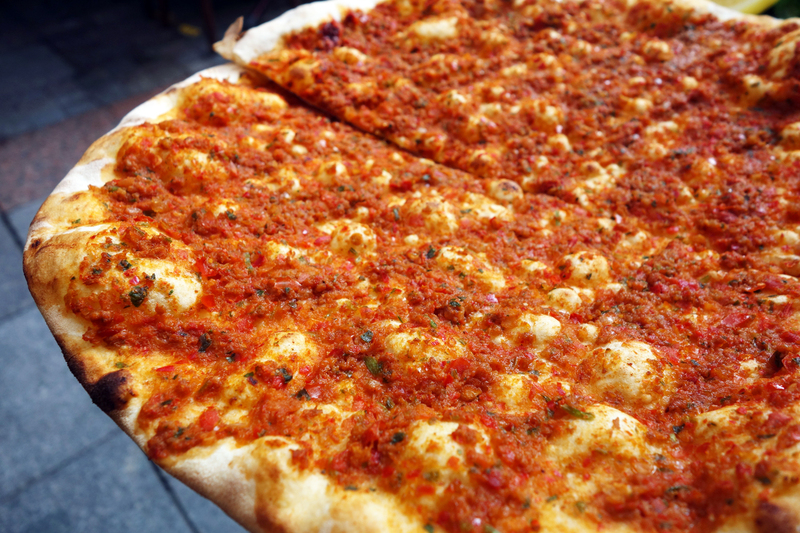 A simple yeast dough called usta is stretched flat and spread with a saucy mix of minced lamb and beef, crushed tomato, onion and spices. “Spicy” comes with crushed red pepper flakes added before baking; the red-hot is coerced gradually out of the flakes by the direct, consistent heat of the oven. Served with finished lahmacun is always lemon and a bucketful of parsley. There’s also more pepper flakes and sumac to sprinkle over. To drink there’s ayran, the diluted yoghurt beverage everyone seems to be sipping on at restaurants around Istanbul. There’s also şalgam suyu, my personal favorite: a sour and spicy drink made from the brine of pickled red carrots that are fermented in barrels with cracked wheat and yeast. The juice is then salted and spiced with hot paprika. It’s a zingy, pungent drink that is only palatable cold, one that wakes and shakes you with its wacky, acrid zest. Until my trip to Istanbul I had thought I was alone in my love of pickle juice, of picked beet brine and jalapeño tears. These are liquids I often drink right from the jar, often quite pathetically and always with my eyes closed. The closest accepted thing I’ve found is leche de tigre made from the pickling juice of fish ceviche and consumed as a hangover cure in Peru, Bolivia and Chile. In Istanbul şalgam suyu is bottled and sold everywhere. It might as well be a Pepsi product, a special Turkish line. As I watched my Turkish friend for her signs of “how to,” she squeezed lemon on one half and piled it high with parsley. She then rolled it up and the brittle bread snapped loudly at each fold. The exterior greets the tongue with a flat, smooth, flour-dusted surface. Then multiple thin layers crackle and crunch. The spicy, sweet filling of tomato and meat gushes out and burns the tongue slightly, packing a mouthful of wonderful usta with great layers of flavor that harmonize perfectly. There’s sweet from tomato, depth and earth from lamb, fruitiness from sumac and freshness from the salad of green parsley rolled up inside. A delicate interplay of burning heat and soothing acidity results from the combination of red pepper and lemon; this contrast keeps things interesting, bite after bite. One lahmacun looks huge but I could’ve easily eaten two and it’s cheap as hell, only 4.50 lira (less than $2USD). Lahmacun can be lunch or a snack in it’s base form, served with lemon and parsley only. It can also be wrapped around pickles, peppers, onions or roasted eggplant as part of a larger meal. I savored every bite of my crunchy, spicy lunch and then spent an hour exploring the market around it. When it was time to go home I got back on the ferry with a stinky bag of pickled veggies to eat in the taxi at the expense of the driver. A gaggle of gulls stalked our ship as it glided past a lighthouse, soaring out of Asia and headed for Europe. Smooth, rounded waves smashed themselves stupidly against the hard steel of the vessel. The sound overcame at first the prayer of millions pouring forth from the mosques that appeared in the distance. As the ferry drew closer to the European peninsula the chanting grew louder, a powerful and eerie plea to Allah that seemed grave rather than comforting to me. It was in those last moments of my trip that I realized how little I understand of a city I had gotten only a snapshot of. Istanbul is not the walking city you adopt as your own in a week. It takes time to see the beauty, to appreciate the diversity, to trust the smiles of strangers while avoiding those that scam you. It takes time to navigate the winding streets and brave the sudden slopes, to barter in markets, to barter in taxis. It does not take much time to make friends though, and the Turks I met were among the most gracious and patient individuals I’ve encountered in my travels. I half hoped the ferry would take me to the wrong port or that time would fly by and I’d have to stay another day. 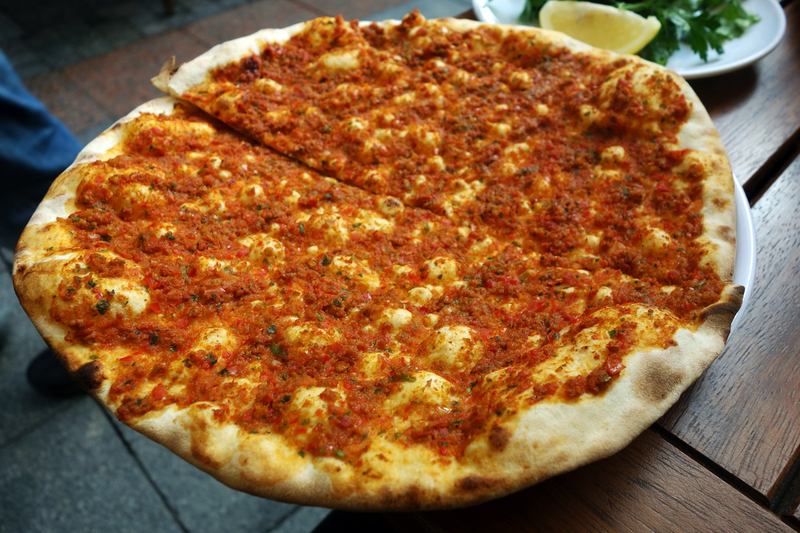 And lahmacun with a friend was a big part of that, a wonderful last meal in Istanbul. December 18, 2014 in ISTANBUL.